In the world of data, we tend to focus on how Big Data technology can optimize our organizations, maximize revenues and make our organizational processes more efficient. However, there is another side to data: one that allows us to use these massive volumes of information to bring back real value to our society. That is why here at LUCA we always love to consider both sides, and explore all the social power that our data can provide. Our next LUCA talk covers the Big Data for Social Good phenomena, in the second of our series of webinars which started in January. LUCA Talk #2 will be held next Thursday (February 26th) at 17:00 CET and it will be delivered by our VP for Big Data for Social Good, Dr Richard Benjamins. Richard will be discussing the immense potential of data in driving progress towards the Sustainable Development Goals - sharing real-life examples of how private sector organizations can analyze and apply data to have a social benefit. 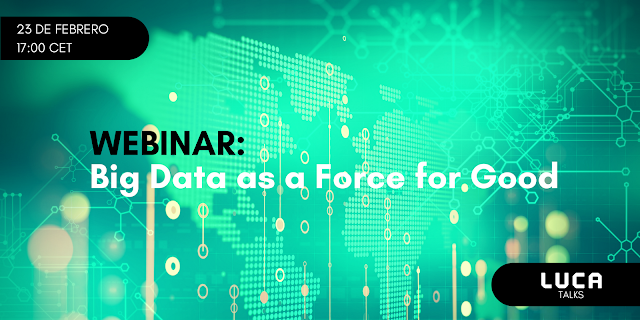 After covering some case studies, both from LUCA and from around the world, Richard will discuss the big challenges companies have to face when it comes to accelerating their Big Data for Social Good initiatives. Haven't signed up yet? Don't miss the chance and do it now here. Figure 1: LUCA Talk 2: Big Data as a Force for Good.